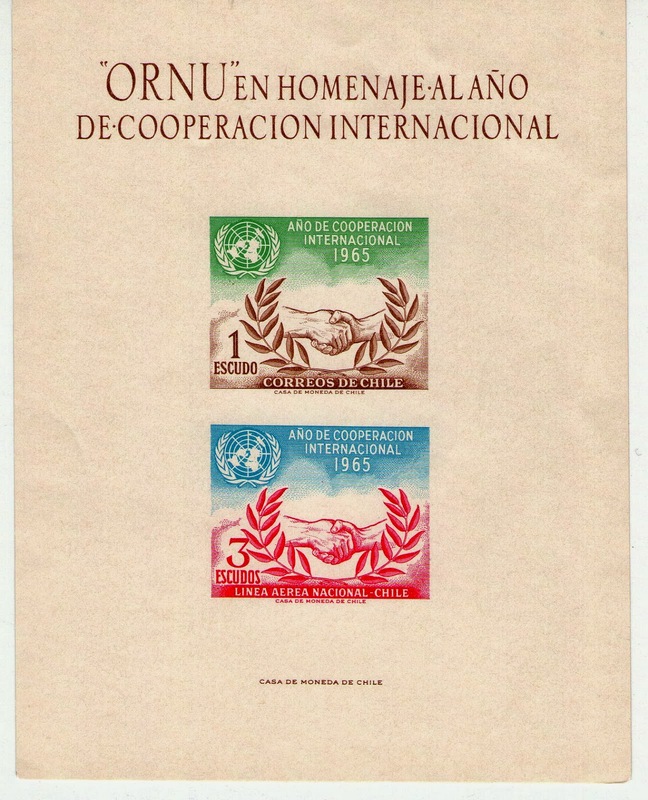 The General Assembly of the United Nations designated 1965 as International Co-operation Year. 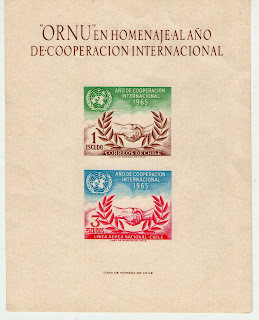 1965 marked the 20th anniversary of the organization, the Charter of the United Nations having been signed in June 1945. 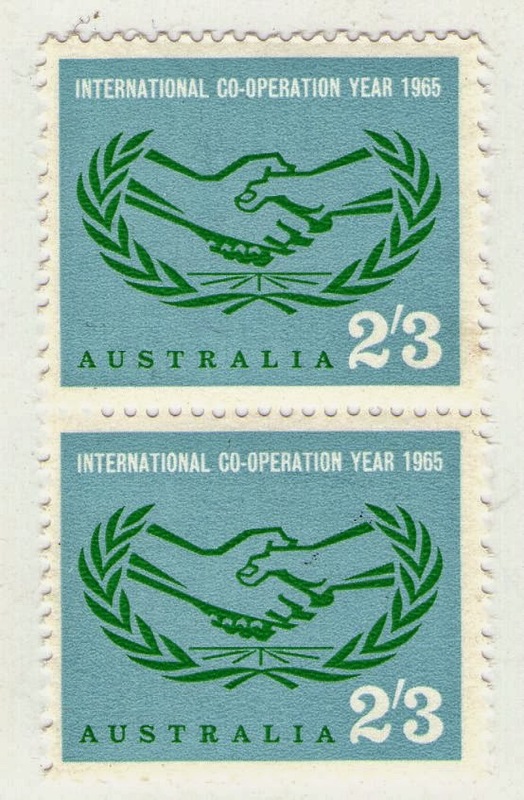 The Graphic Presentation Unit of the United Nations Secretariat brought out a design of clasped hands within a laurel wreath .. 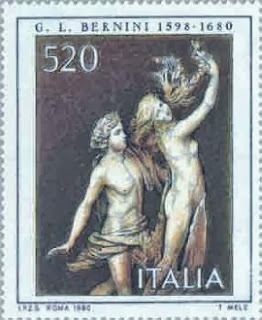 This illustration was used by many member States as the basis for their commemorative issues. A handshake is a short ritual in which two people grasp one of each other's opposite hands. 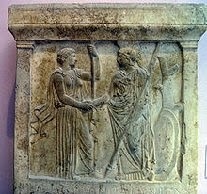 Archaeological ruins show that handshaking was practiced in ancient Greece as far back as the 5th century BC. The origin of Laurel Wreath is said to have come from Apollo’ love/lust for Daphne. Daphne was not a goddess and she begged to Gaia save her from his advances. Gaia did this by turning her into a laurel tree just as Apollo reached for her. Disappointed, Apollo wove a wreath from the branches of the tree (made from the leaves of his beloved) and wore it on his head . Therefore, in honour of Apollo, the victor of Pythian Games received a crown of laurel leaves. It has remained a symbol of victory ever since, and as peace usually follows victory, it’s meaning has expanded to symbolize peace. So, did this little stamp and its brothers change the world? We will never know, but... it couldn't have done any harm! Why is Christmas celebrated on the 25th of December? Christmas or Christ's Mass is one of the most globally recognized midwinter celebrations. A winter festival was the most popular festival of the year in many cultures, culminating on the Winter Solstice, the shortest day of the year. In 46 BCE, Julius Caesar in his Julian calendar determined that the winter solstice occurred on December 24 (for the Northern Hemisphere). So, starting with December 25, the days get longer again. This apex was called “Dies Natalis Solis Invicti “ which means "the birthday of the unconquered Sun." Early Christians believed that Jesus Christ was equally unconquered and consequentially they wanted his birthday to occur at that time of the year. Also, like many of the biblical prophets before Him, they assumed that He was conceived during the Vernal Equinox - exactly 9 months before the Winter Solstice. Before Christianity, Winter Solstice was celebrated with a feast in honour of Saturn, the Roman god of agriculture and plentiful harvests. The feast was called Saturnalia, and it was introduced around 217 BC Saturnalia was a time of celebration, of visiting friends, and of gift-giving, particularly of wax candles (cerei). Northern Europe also celebrated a winter festival called Yule, Scandinavians still call Christmas Jul. In England, since 900 AD, the word Yule has been synonymous with Christmas. 2. Was Santa Claus a real person? The model for Santa Claus is thought to have been Saint Nicholas (270–346 AD) or Nikolaos of Myra, a saint and Greek Bishop of Myra. He had a reputation for secret gift-giving; such as putting coins in the shoes (hence the Christmas sock?) of those who left them out for him. 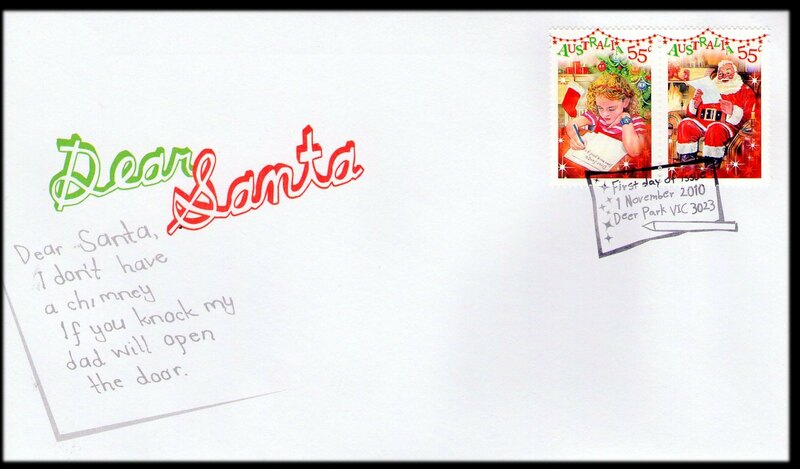 Good deeds and gift giving in the tradition of St. Nicholas is now well entrenched in the spirit of Christmas. 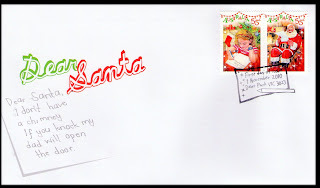 Including his practice of not admitting of being the gift-giver: by attributing many gifts as coming from ‘Santa’; especially when giving to children. 3. What are the 12 days of Christmas? The Twelve Days of Christmas is probably the most misunderstood part of the church year among Christians. Contrary to urban legend, these are not the twelve days before Christmas, but are the twelve days after Christmas ending on the January 6th; the Epiphany. This is day that is usually celebrated as the time the Wise Men or Magi arrived to present gifts to the young Jesus; hence in many cultures it is also a day of gift-giving. THREE French Hens = Faith, Hope and Charity or the Holy Trinity itself. 4. 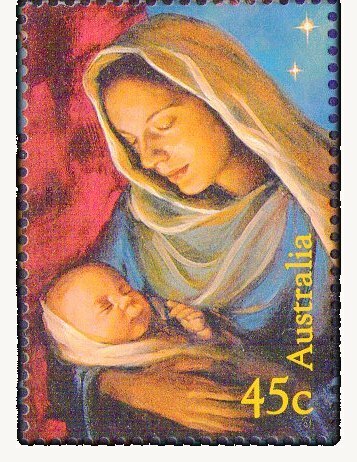 Which Nation released the first Christmas stamp? 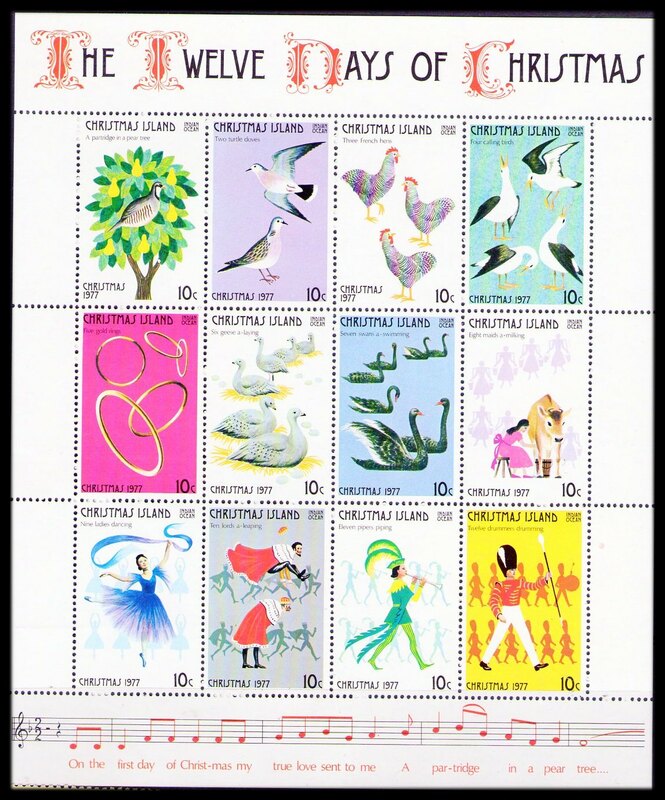 It is a matter of interpretation and definition as to which stamp is the first Christmas issue. The Canadian map stamp of 1898 bears the inscription: "XMAS 1898", but it was actually issued to mark the inauguration of the Imperial Penny Postage rate. 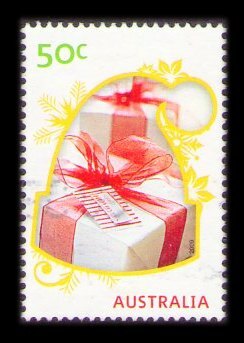 Some claim that the first Christmas stamp in the world was printed in Denmark in 1904 as it said 'Julen 1904' (Christmas 1904). However, most collectors reckon that the 1943 issues from Hungary were the first, real Christmas stamps as they had more than just words and depicted the Message to the Shepherds, the Nativity, and the Adoration of the Magi . 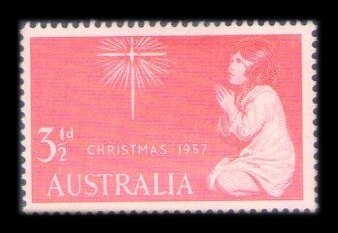 The next Christmas stamps did not appear until 1951 (Cuba); 1954 (Haiti); 1955 (Luxembourg and Spain ), then in 1957 (Australia, Korea, and Liechtenstein ). 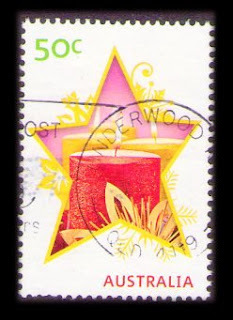 Shown above are Australia’s first Christmas stamps: a 3½d Red and a 4d Purple. They were issued on the 6th of November 1957. 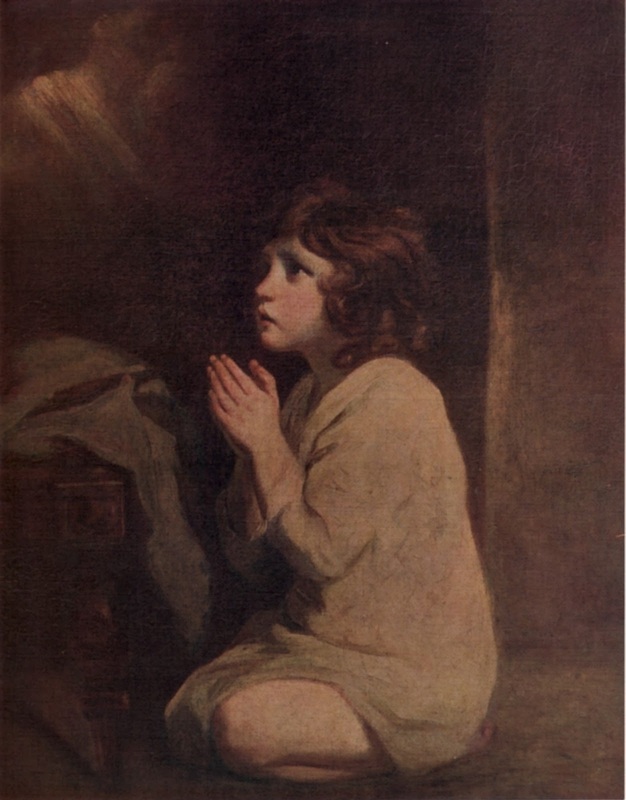 Their design was adapted and engraved by Donald Cameron from the original painting "The Infant Samuel at Prayer" by Sir Joshua Reynolds. 86,258,000 copies of the 3½d and 94,333,200 copies of the 4d were printed by W.C.G. McCracken on un-watermarked paper with perforation 14¼ x 14. In Australia and in many other Nations, that issuance marked the first of what became an annual tradition. 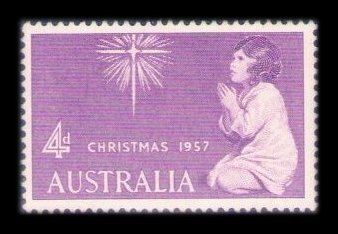 The most popular theme is a nativity scene as is shown below in the last Australian pre-decimal issue in 1965, on cover. I like to collect Australian pre-decimal and decimal covers. 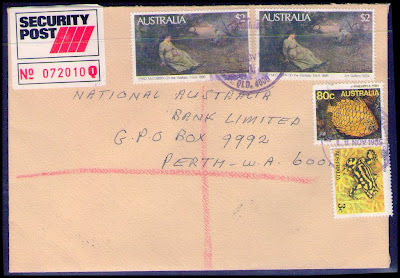 Some of the latter can be quite interesting as long as the postmarks correspond with the period of issue of the stamps. 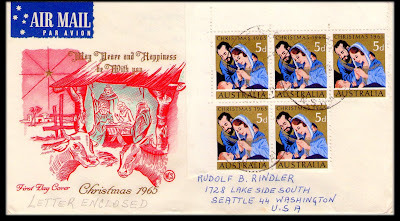 Recent covers with old stamps are not as attractive to me. Also it is more to my licking if the covers are not obviously philatelically inspired. 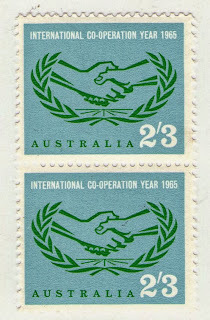 The 1972 Pioneer Life in Australia definitives are also very common used and can be found in quantity in most kiloware. On cover they are also a bit scarcer. The small note in brackets reads " for Fred". 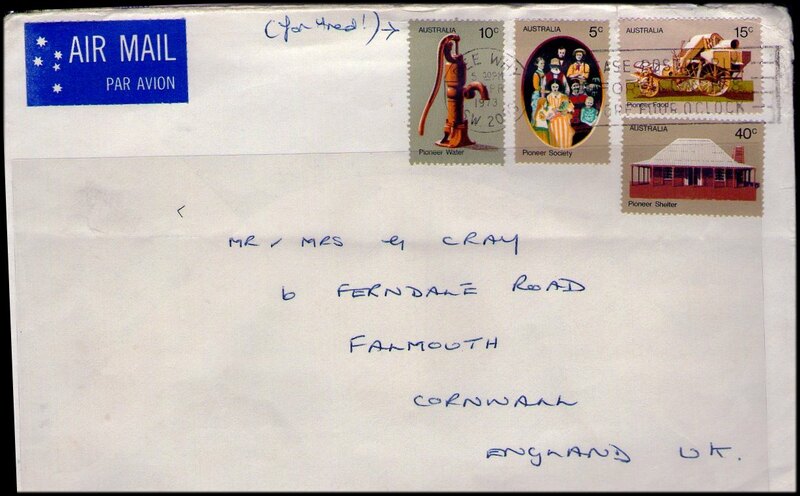 Fred was/is probably a stamp collector so whether you class this cover as a postal use or not is debatable. Again to find one of the Navigator series still on cover is not common. Besides that, I think this is such a pretty cover. Foxing – is it a health hazard? 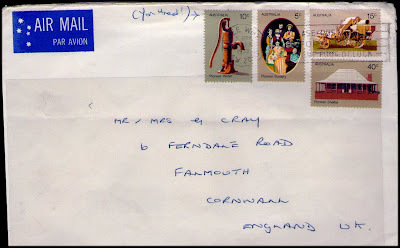 For many years philatelists the world over have ‘felt’ that foxed stamps should be kept away from the rest of their collections. Many suspected that foxing and toning could spread just like an infectious disease, from one stamp to another. 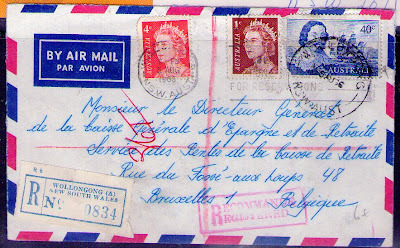 Almost all stamp dealers and a lot of collectors regularly find themselves sorting and coming into close contact with old collections, which may be riddled with foxed/toned stamps and albums. The mouldy smell that these emanate is a sure sign that a fungal infection is rife. But is it just a bad smell or is it something much more sinister? A preliminary investigation using a Scanning Electron Microscope by Dr. Patrick Trimby (SEM section manager at the Australian Centre for Microscopy & Microanalysis (ACMM) at the University of Sydney) on two samples provided by the author has confirmed previous studies, carried out on foxing of archived paper, that one of the main culprits of foxing in paper and paper-like items, like stamps, is a fungal infection. The Australian Centre for Microscopy & Microanalysis (ACMM) at the University of Sydney is the largest and most comprehensive facility of its type in Australia and is the headquarters of the Australian Microscopy & Microanalysis Research Facility (AMMRF), a national grid of equipment, instrumentation and expertise in microscopy, microanalysis, electron and X-ray diffraction. Researchers at the ACMM have access to an outstanding array of imaging and analysis equipment, supported by over 40 dedicated research, administrative and technical staff. Each sectioned sample was coated with a thin layer of metallic gold (this is a necessary step for the reflection/refraction of the electron beam) and then were imaged, using a standard SEM. 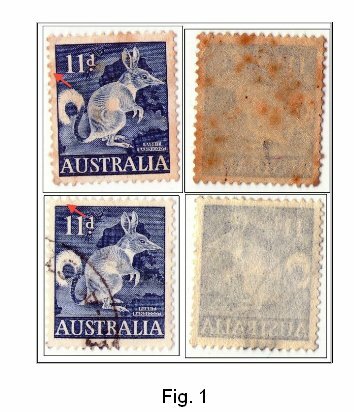 Dr Trimby reported that the results showed 2 clear differences between the foxed and not-foxed areas on the stamps (see fig. 2). 1. The foxed areas have a relatively high abundance of fungi. In the attached images the fungal hyphae (thin tendrils) are clearly visible, as well as a number of conidiospores (fungal spores). However, he did not find any evidence for fungi in the not-foxed sample, just some small crystalline fragments on the surface. 2. The foxed sample had a much more porous paper structure with the cellulose fibres clearly exposed much more so than in the not-toned sample. 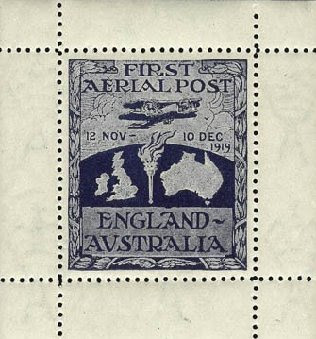 This would suggest that either the stamps have been manufactured from different paper batches with different quality (unlikely for this issue), or more likely, that a filler or some fibres have been etched away over time (maybe as a result of paper acidity or as a result of fungal activity or both), leaving lower fibres exposed to continued attack. The first instance of foxing was reported 1848, it is believed that it was named after the rusty colour of ‘Reynard the Fox’. Surprisingly, research into the causes and the prevention of foxing has been scarce, especially in relation to philatelic material. This is surprising for two reasons: first; stamp collecting has for many years been the most popular of hobbies and second; stamps are among the most valuable (in terms of prices at auctions) items on the planet. The problem of foxing in archived paper has been investigated off and on for about sixty years, most researches seem to agree that, although the onset of foxing maybe caused by a number of factors, either acting singly or in concert, all will eventually involve some form of fungal infection. It has been estimated that there are around 1.5 million species of fungi, with about 5% of these having been formally classified. About 100 species have been recognised as having the ability and/or the inclination to ‘digest’ cellulose and cellulose containing materials like paper. Aflatoxins are among the most carcinogenic substances known. Aflatoxins belong to a class of compounds known as mycotoxins. Over 300 mycotoxins are known and all they are produced by several species of fungi. Most of the mycotoxins of concern are produced by three genera: Aspergillus, Penicillium, and Fusarium. Aspergillus flavus and Aspergillus parasiticus have received most of the attention as they infect our main food sources: cereal grains, potatoes, fruits and nuts. The term aflatoxin is actually derived from the abbreviation for Aspergillus flavus: A. flav. In the 1960 more than 100,000 young turkeys on poultry farms in England died in the course of a few months from an apparently new disease that was termed "Turkey X disease" Research showed that the disease was associated with the animals’ feed: a mouldy peanut meal imported from Brazil. At the time, little was known about Aflatoxins, but some scientists suspected that they would be linked to liver cancer in humans. Soon after the U.K. outbreak, a young MIT toxicologist named Gerald Wogan launched a thorough, decades-long investigation into the toxins, eventually exposing them as the most potent carcinogens humans can encounter. Epidemiological studies carried out in Thailand in the late 1960’s during a period of 5 years showed that there is a high correlation between the ingestion of mouldy food and the occurrence of lever cancers. Burg et. al. after an extensive study of airborne Aflatoxins produced during the handling of contaminated corn, concluded that the concentration of Aflatoxins in the lungs may actually be higher and more potentially dangerous when breathing contaminated air than the concentration of the same toxins in the stomach after eating mouldy food e.g. peanuts. Chronic, or continued exposure may lead to a high risk of developing liver cancer, as aflatoxin metabolites can cause mutations known to cause liver tumors. Children, are particularly affected by aflatoxin exposure which leads to stunted growth and delayed development. The International Agency for Research on Cancer (IARC) has designated aflatoxin as a human liver carcinogen. You will have no doubt noticed from Table 1 that Aspergillus flavus, the organism that produces the most toxic aflatoxin known, Aflatoxin B1, was identified in connection with foxing of paper. 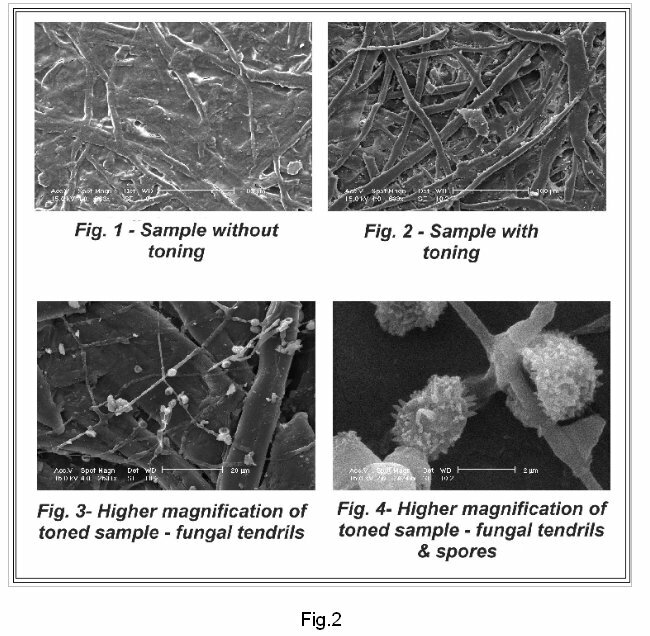 The SEM pictures shown above are not sufficient evidence to identify the actual species of the fungus, but an expert mycologist wrote, after viewing the SEM photos above, in an email to Dr Trimby that from the appearance of the spores the fungus in the electron micrographs could possibly be an Aspergillus. Are these organisms associated with foxing in stamps? Do they pose a threat to the long term health of collectors and dealers? Can toning be prevented, cured, stopped? Should toned stamps and other toned philatelic items be permanently sealed or even burned? All these are important question to our hobby and further work is not only vital to the health of our little printed friends but also to our own health. Consider how many collectors and dealers are world-wide and how many of these live in tropical and semitropical environments – conditions ideal for fungal growth. Consider how many times you have de-papered stamps that may have been infected (just like in food stuffs, browning occurs in the later stages of fungal attack, perfect- looking items may in fact be riddled with the fungus). Consider how many times you have handled and inhaled the fetid air from old collections. Consider the two major up-and-coming stamp regions: China and India; both densely populated; both with tropical and sub-tropical regions and both with increasing numbers of enthusiastic collectors. This preliminary study, described at the beginning of this article, was done with no funding and was completely due to the author’s interest and the generosity of Dr. Trimby and of his Department. Essential further work will require funding from interested parties…and that could include you, if you are reading this article. The World's most valuable Cinderella? 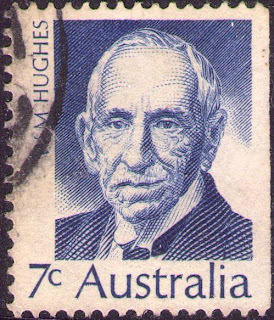 Billy Hughes was the seventh Prime Minister of Australia from 1915 to 1923. 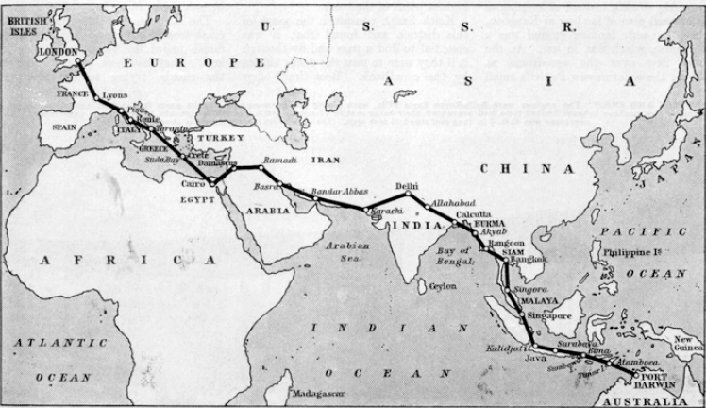 In 1919, Hughes and former Prime Minister Joseph Cook travelled to Paris to attend the Versailles peace conference. He remained away for 16 months, and signed the Treaty of Versailles on behalf of Australia – the first time Australia had signed an international treaty. 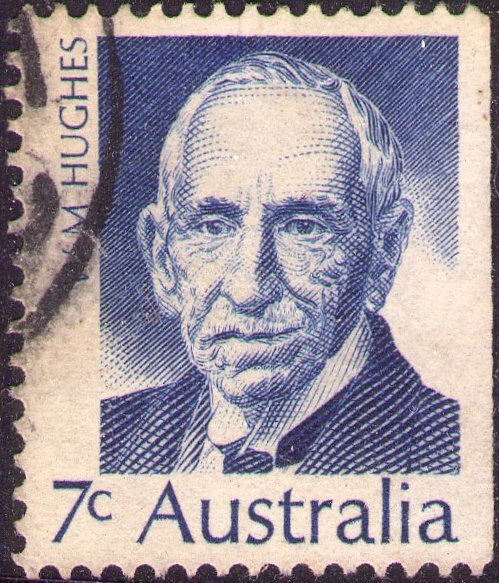 After meeting the Australian Flying Corps pilots (from World War 1), the idea of an Air Race took hold in Billy Hughes’ mind as he was keen to promote air travel and air mail delivery to Australia. The Air Race was announced in March 1919. The rules were simple: British aircraft; Australian pilots; Departure after September 8th and trip to take no longer than 30 days. * NOTE: a full account of this race can be found in a great book: Australia's Greatest Air Race by Nelson Eustis. · Issued 8th march 1972. 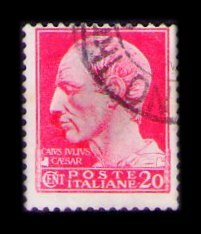 · Each pane of 5 stamps and 1 descriptive tab. In a Vickers Vimy bomber; Captain Ross Smith, his brother Lieutenant Keith Smith (as assistant pilot and navigator) and two mechanics Sergeants W. H. Shiers and J. M. Bennett, took off from Hounslow, England, on 12 November 1919 bound for Australia. Flying conditions were extremely poor and most hazardous from the start! They were caught up in a blizzard and almost froze to death just flying from England to France; from then on things seemed to get worse! They were hounded by bad weather, poor visibility, poor landing and taking off conditions at almost every stop. They almost had head on crashes with mountains hidden in mist or rain on at least two occasions. A poor landing-area at Singora and torrential rain almost brought disaster. Disaster again almost came at Sourabaya where the aircraft was bogged and had to take off from an improvised airstrip made of 350 yards bamboo mats, laid down by 200 natives! In Singapore, the only place that they could land was in a race course, which was much too short. Sergeant Bennett had to climb out of the cockpit and slide down to the tail so that it would sink in on landing and act as a brake! Nevertheless on 10 December they landed in Darwin, Australia. The distance they had covered was 11 340 miles It took just under 28 days with an actual flying time of 135 hours at an average speed of 85 m/h Both Ross and Keith were knighted; Sergeants W. H. Shiers and J. M. Bennett, were commissioned and awarded Bars to their Air Force Medals,. 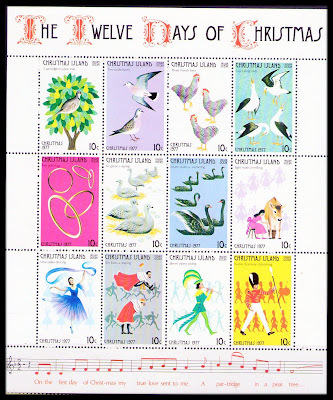 · Issued 29th August 1994. 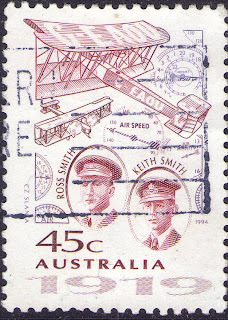 10th December 1919 - Ross Smith speaks to Prime Minister Billy Hughes and tells him that they had flown in special mail for the occasion and would it be possible to issue a special stamp? 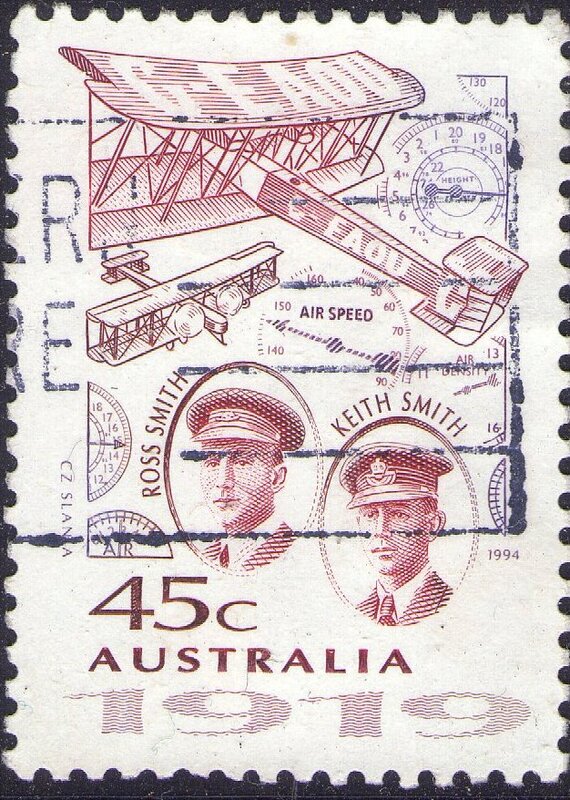 This caused the ‘penny to drop ‘in Hughes mind: Ross wanted a postage stamp not a date stamp! He was reluctant to refuse his hero anything. 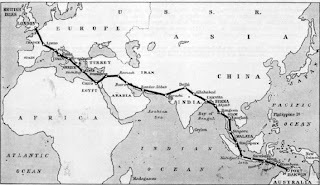 He immediately telegrammed back that Ross was to hold the letter till his arrival in Melbourne. He also asked how many letters were involved (to know how many stamps to print). Ross answered that he had 200 letters. 15th January 1920 - Steps were taken to issue a Cinderella for the occasion (at the time UPU rules prohibited the use of commemorative stamps of limited postal validity.) The design of the stamp was prepared by Lt. George Benson an official war artist at Gallipoli. It was printed by lithography in deep blue from a copper half-tone block onto watermarked paper as a miniature sheet format. 27th January 1920 - eight proofs were submitted to Prime Minister department for approval. 20th February 1920 - 576 stamps were delivered to the Prime Minister’s department. 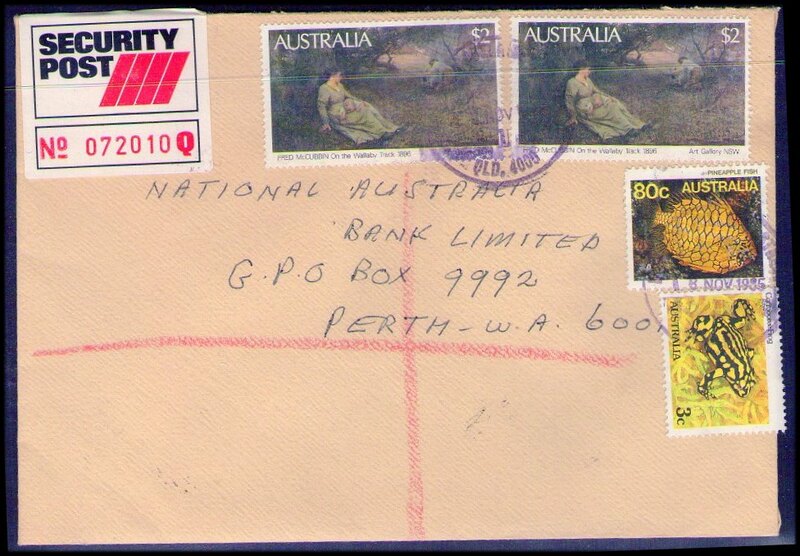 The Australian Air Mail Catalogue lists the Cinderella with a CV of up to $20 000 as MNH and from $9 000 on cover.